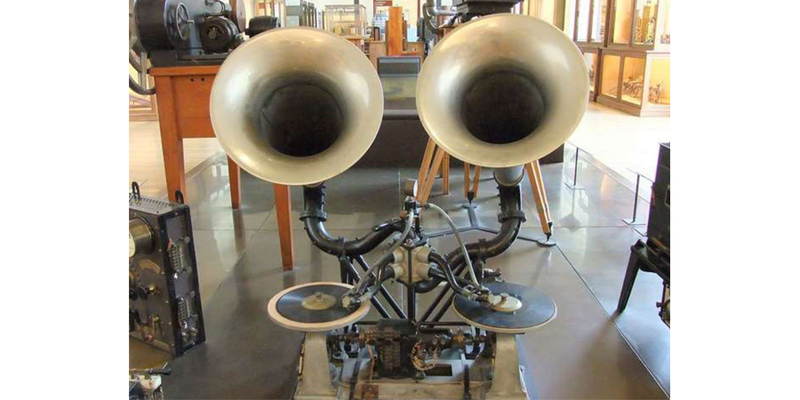 In 1910 Gaumont demonstrated his Chronophone system, which synchronised sound and film, at the Gaumont Palace in Paris. The compressed-air amplifier, which he called the Eglephone, was just a part of the whole system. The volume was enough for an audience of 4000. Initially the longest moving picture that could be made with synchronised sound was only 200ft, due to the limited playing time of the Gramophone record. (Projection was at 16 frames per second) Gaumont surmounted this problem by having two gramophone platters; a deft operator could switch between them to give a more or less continuous soundtrack.